One of the most asked questions, when we are dealing with our clients, is “what’s the best location to get wedding photos in Melbourne?” This is a sort of depends-on-you question. Melbourne is the city known for its greens, the historical buildings from Victorian Era, the stunning coastal line and the cultural diversity. So the great thing with getting wedding location photos around Melbourne is you have various options to choose from. Now, let’s get to the point, the best wedding photo locations in Melbourne, in a professional wedding photographer’s point of view. Set on Spring Street, East Melbourne. Parliament House is one of the most popular and iconic wedding photo locations in Melbourne. Constructed from 1855, Parliament House is the place to offer a grand, classic and historic backdrop for your wedding photos. It can perfectly match your lavish and elegant wedding theme. As a popular and open to the public place, Parliament House has some drawbacks for taking wedding photography here. No matter on weekdays or weekends, It normally has quite a few people here and delivers a hustle and bustle kind of feelings. During the busy season, you may have to wait for other couples who arrive earlier and your photographer persuading the tourist to walk away from their camera. South Melbourne Town Hall is a historic civic building on Bank Street, South Melbourne. Lots of master Melbourne wedding photographers love here as it has a quiet and relaxing atmosphere to do wedding photography. 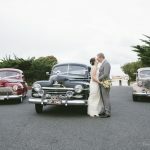 You could also organize the wedding day cars parking in front of the buildings. Now your photographer could capture you, the cars and the backdrop historical building in one image. Plus, there are some iconic Melbourne wedding receptions set nearby – Crown, Luminare, The Park, Carousel, Show Time Event Center, Cargo Hall and Aerial. You normally won’t need more than 10 mins to drive there. Although South Melbourne Town Hall normally doesn’t have heaps tourists, it is a place incredibly favoured by Melbourne wedding photographers. I have seen 4 couples in front of the Town Hall and have their own wedding photographer capturing them. Scattered in the Melbourne CBD, RMIT University has a few heritage listed buildings and contemporary architectures where could be your perfect wedding photo locations. 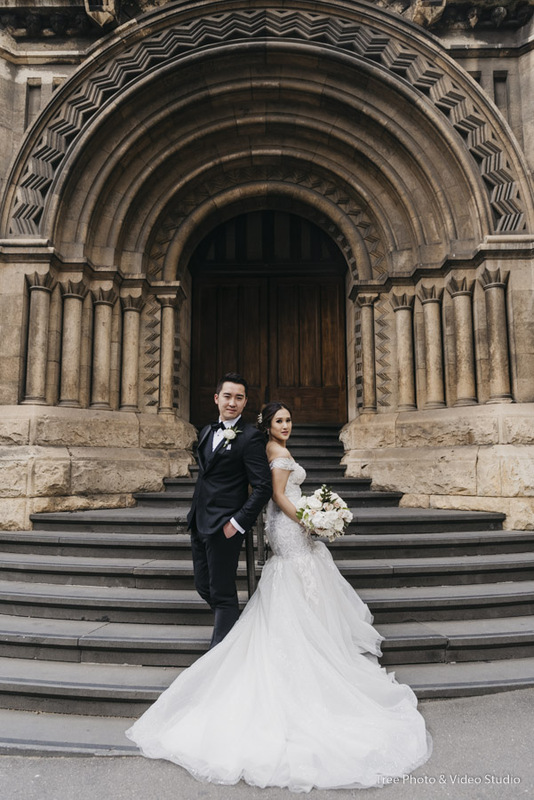 One of the most iconic locations is the Building 20 at the corner of Russell St and La Trobe St. Used to be the Magistrates’ Court, This historic building’s Romanesque style blend the ancient British feel in your wedding photos. As a public university, RMIT is normally busy during the weekdays. So heading there for a weekend wedding is more feasible than weekdays. If you plan to have a weekday wedding, it is probably not the right place to shoot wedding photos. Built from 1879, Royal Exhibition Building and Surrounds Carlton Gardens is a go-to wedding photo location in Melbourne. Located on the North-Eastern edge of Melbourne CBD, it is one of the iconic places display Melbourne in front of the world. The 26 hectares of manicured gardens, historical building and contemporary architecture make this place suitable for most wedding themes. The spawning lawns, the tree-lined pathway and the charming fountain in front of the Royal Exhibition Building provide the stunning backdrop for your wedding photos. There are some well-known wedding receptions set on the inner northern suburb, such as the San Remo Ballroom and Regal Ballroom, where has an easier link to Carlton Gardens. Expanding on 560 acres of Parkland, Albert Park Lake and its surrounding Gardens is simply a gorgeous place for your wedding photo. This is the place where perfectly mixed with the natural and modern feel. The swans, the tropical trees, the boat on the lake, the buildings from near to far and city skylines, these above could all be the perfect view for your ‘wedding photography. There are also some iconic waterfront wedding receptions surrounding the lake. Your wedding day can definitely run seamlessly when you choose your wedding reception and wedding portrait all here in Albert Park Lake. Known as the most iconic place for Melbourne’s street art, Hosier Lane is a unique place for your wedding photography. The walls at this laneway are filled with vibrant colours, edgy graffiti and stencils. If you are planning a classic and traditional wedding, this is probably not the right place for you. However, if you plan to connect your wedding with Melbourne street art and contemporary feel, Hosier Lane is one of the best places that Melbourne could offer. As Hosier Lane is set in the heart of Melbourne CBD, the traffic and parking is always a non-easy job. Set on Stuart Street in South Bank, Australian Center for Contemporary Art is one of the best wedding photography locations for the weddings in Melbourne urban area. When you plan to have some exceptional wedding car involved to your weddings, such as the extra long limo, multiple sports and vintage cars, and a group of Harley Motorbikes, ACCA is the place for you. 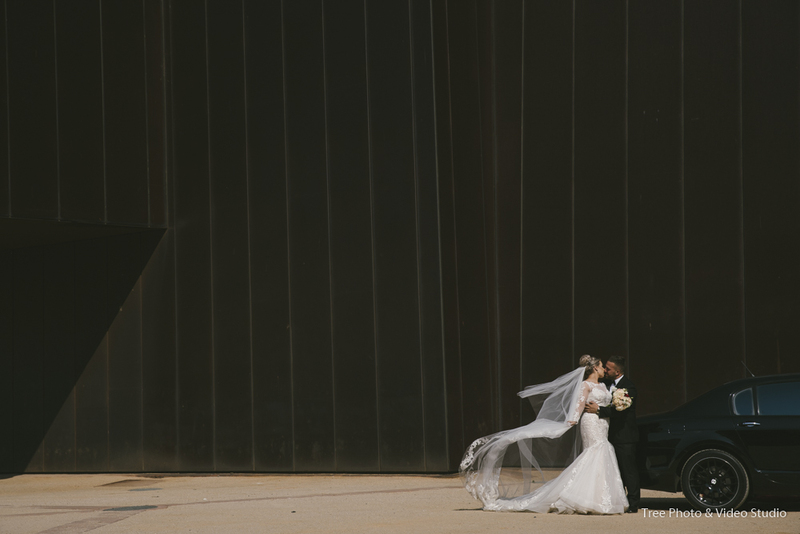 with a contemporary architecture backdrop, incredibly spacious parking room, Melbourne’s heart location and a normally quiet environment, I will say it is my No.1 place if you ask to have some dramatic wedding photos with you and your cars. Found in 1861, National Gallery of Victoria is an art museum with longest history, largest space and most visited people in Australia. 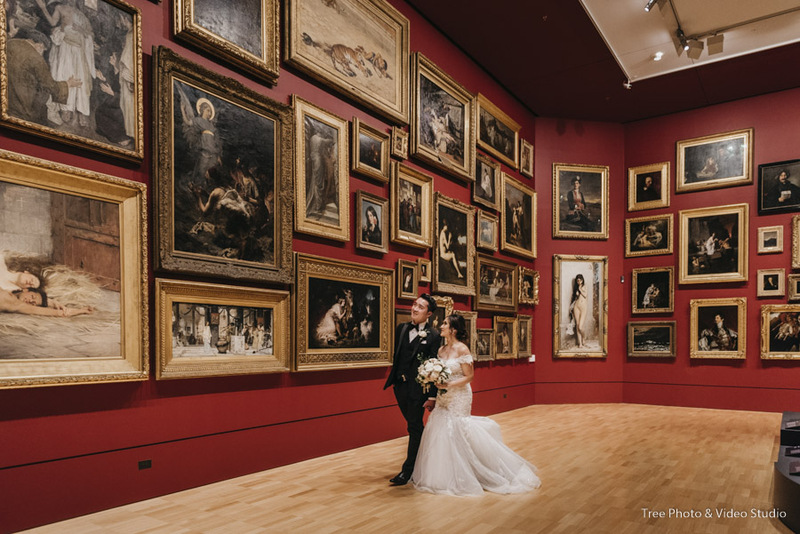 If having a unique wedding with both the historical and contemporary art feeling is your MO, NGV is definitely the place for you. 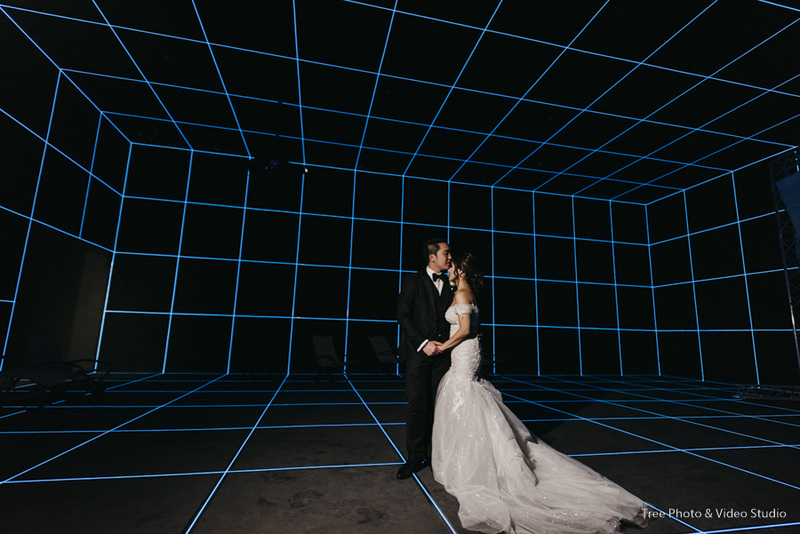 The stained glass ceiling with the cathedral height, the edgy contemporary art display room and its convenient South Bank location are all the bonus point for NGV to be a wedding photo location. Set on the foreshore of Port Phillip Bay in St Kilda, Luna Park is an iconic amusement Park in Melbourne. When you choose to have your wedding photography at Luna Park, it can provide an atmosphere filled with fun. It is a wedding photo location like no others. 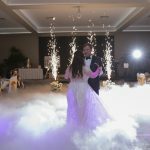 Some unique wedding receptions, such as Encore, The George Ballroom, Harbour room, sit within 10 mins driving from Luna Park. 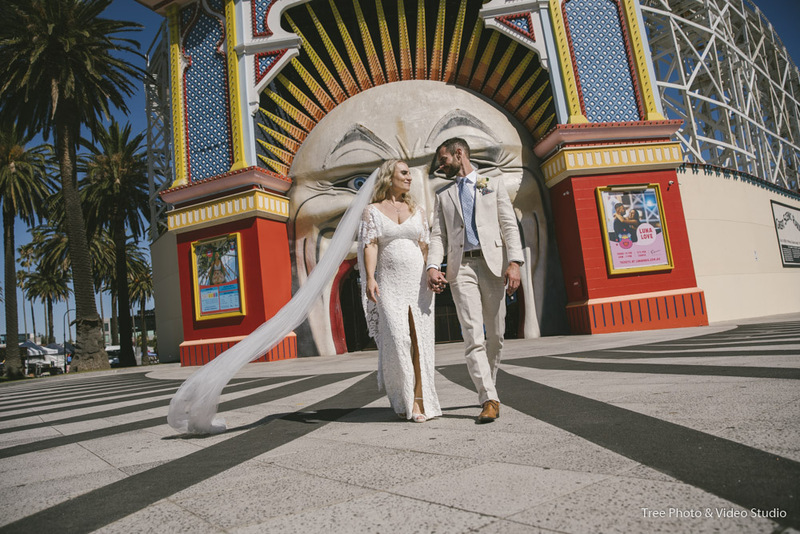 When you planning the wedding celebration in St Kilda and want to have something fun for your wedding, Luna Park is the right place. 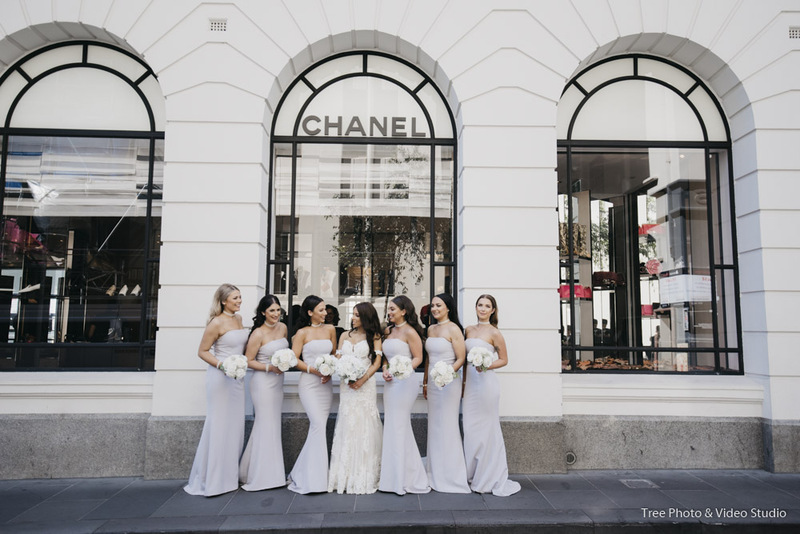 Sit on Flinders Lane, the Boutique Chanel shop has a contemporary architectural render wall, which is a perfect backdrop for modern and dramatic wedding photos. The fashion and elegant feeling delivered by Chanel mixed with the Melbourne street culture make here one of the favourite places for wedding photography locations. The shortcoming is traffic and crowed passengers. Leave a bit of flexible time here is essential. Set on Port Phillip in Port Melbourne, Princes Pier is a historic pier with 580 meters out over the ocean. It is one of the best places to capture your wedding photos with the stunning Port Phillip view and original wooden pillars as the backdrop. 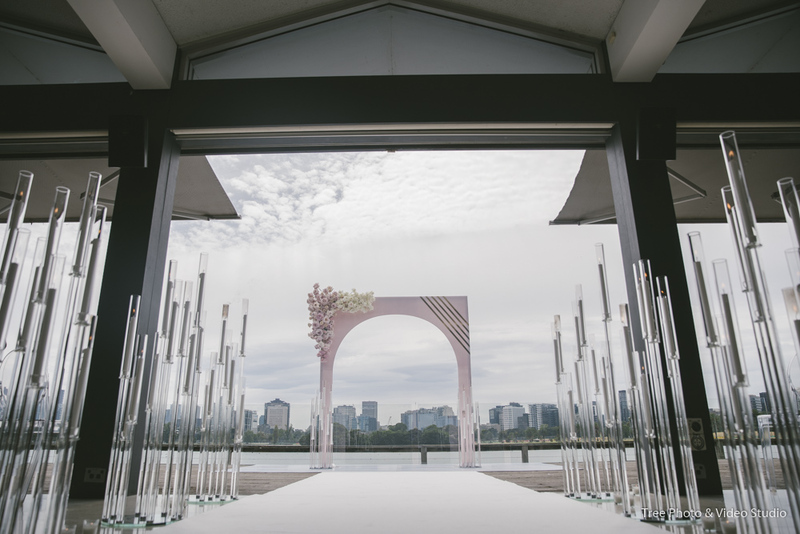 When you already choose to celebrate your wedding at Melbourne CBD or south inner suburb location receptions, Princes Pier is a perfect wedding photo location with superb traffic conditions. The drawback is you need to have a plan B. When Melbourne’s weather turns crazily windy and rainy, Princes Pier, same as the other coastal photo locations, is not the place you want to visit. It doesn’t have any cover there and the wild wind or rain could mess your hair or wedding dress. Before confirming the wedding photo location choice with your wedding photographer and cinematographer, I will always ask the couple to consider the real wedding day schedule. 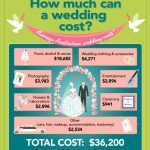 Depends on your culture, your budget, your wedding ceremony and reception venues, the typical time for wedding photo locations, between the wedding ceremony and reception, is 1 to 4 hours. 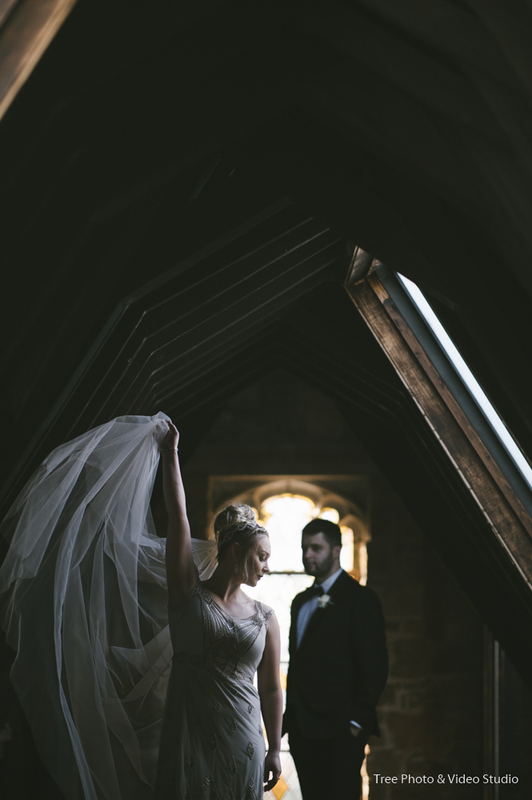 No matter how much time we have for wedding location photography, avoid spending hours travelling is a smart choice. My Suggestion is to choose your wedding photo locations within 30-min driving from your wedding ceremony or reception venues. Make sure your wedding day runs seamlessly is the prime goal.